At The Balloon & Kite Company we specialise in decorating venues, weddings and events with balloons. This can range from table arrangements, freestanding arrangements and arches to balloon sculptures, balloon drops and even balloon pyrotechnics! With more than 20 years experience of decorating weddings and other occasions with balloons, we will be happy to help you plan the decoration that best suites your venue and budget. Transform the venue for your special day. 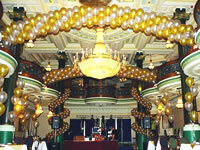 See examples of the balloon decoration we provide for weddings. Including corporate events, birthdays and special occasions. 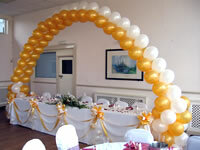 See examples of balloon decoration suitable for all occasions.